John Anderson overlooking his riparian forest and restoration area on Yanci Ranch. California landowners have a number of important reasons to value riparian forests. They offer shade to cattle, provide critical erosion and flood control, sequester carbon and support abundant wildlife. Yet many landowners, especially those already stretched to manage their farms and ranches, often overlook these benefits in their day-to-day work. Unfortunately, California’s riparian forests are dwindling, covering only 5 percent of their historic range. That’s why Environmental Defense Fund (EDF) is working with leading researchers in the state to measure the wildlife and carbon benefits of riparian restoration, with the objective of bringing new funding sources to stewards of private lands. 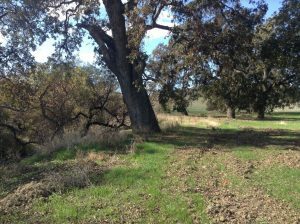 One landowner who is working actively to create riparian forests on his ranch is John Anderson, owner of Yanci Ranch in Yolo County. An experienced steward of his land, John has gone the extra mile restore the remnant riparian forest on his property. Giant valley oaks line the creek channel at Yanci Ranch. A healthier riparian forest would have a dense canopy and shrub understory, which provide important food sources and habitat for species. When he first acquired the ranch ten years ago, John changed the grazing regime to benefit native vegetation. More recently, he has worked to expand and protect the remaining riparian forest with the aim of restoring the natural diversity and function of the forest after decades of grazing pressure. Not every landowner has the capacity to do what John is doing, but in California, more and more opportunities are opening up to help farmers and ranchers conserve and restore riparian forests by recognizing the economic value healthy forests provide. Virginia Matzek, a riparian ecologist from Santa Clara University, is developing a carbon quantification methodology to assess the carbon sequestration potential of riparian forests. Early research shows that landowners who plant riparian forests can earn back their investment under the state’s protocol for carbon credits. Now, Matzek is working with the Department of Conservation to open up new sources of funding to give landowners more options to earn income as they protect and restore riparian forests. 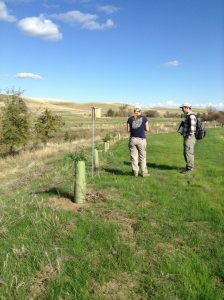 Virginia Matzek (left) and Evan Patrick (right) alongside restoration plantings at Yanci Ranch. The Sustainable Agriculture Lands Conservation Program (SALC) is specifically devoted to purchasing agricultural easements that reduce carbon emissions. In 2016, SALC awarded $37.4 million in grants to preserve nearly 19,000 acres of farmland. In the future, the Department of Conservation expects to use Matzek’s carbon tool as a new vehicle to qualify farms for easement funding. SALC is an exciting opportunity, but the value of carbon by itself is sometimes too low to cover the costs of an extensive restoration project. That’s where the Central Valley Habitat Exchange comes in. 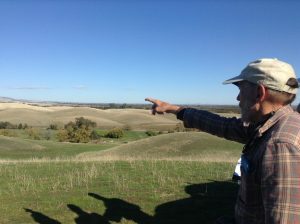 The Central Valley Habitat Exchange (Exchange) is aiming to develop incentives for landowners to create measurable habitat benefits on their land. Through the Exchange, partners like Audubon, Point Blue Conservation Science and EDF have developed a riparian bird habitat quantification tool to quantify the wildlife benefits of riparian forests. The tool allows scientists, landowners, and funders to use a common language to measure and compare the wildlife benefits of riparian restoration across sites. 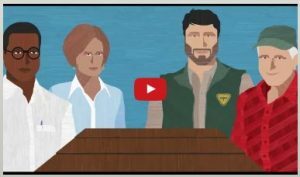 Click to watch a video and learn how the habitat quantification tool works to bring greater confidence to conservation. Riparian birds are of incredible interest to wildlife agencies in California, with a number of rare and protected species dependent on this particular habitat. Because of this, large grant programs are aimed at saving and restoring riparian habitats for vulnerable species. By measuring wildlife benefits, the riparian bird habitat quantification tool is poised to tap into these funding sources to advance riparian restoration on working lands. Matzek and partners of the Exchange are confident that these two riparian habitat assessments can be combined to value riparian forests more holistically to capture both habitat and carbon benefits. We hope the outcome of this effort will provide an important step forward to enable farmers and ranchers, the State of California, and wildlife to more fully benefit from all of the values that riparian forests provide. This entry was posted in ecosystems, Habitat Exchange, Sustainable Agriculture, Wildlife Protection and tagged california, central valley habitat exchange, conservation, habitat quantification tool, national bird day, ranchers, riparian forests, wildlife. Bookmark the permalink. Both comments and trackbacks are currently closed.